The perfect recipe to remind you of home. 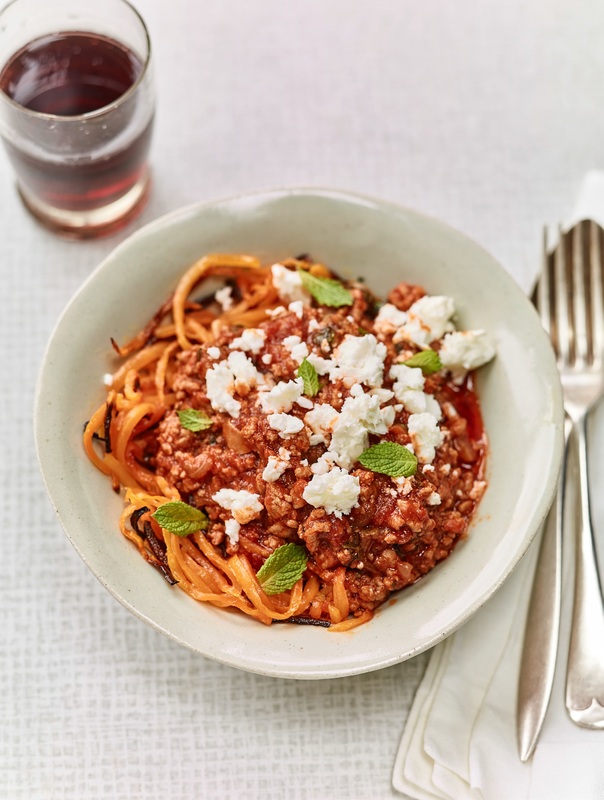 Try these spiralised squash noodles with bolognese sauce for a different take on a truly delicious good old classic. My cousin Harriet is a mother of two and lives in New York. She says she gets very homesick, so when I asked her for a recipe idea she said that she cooks from my first book all the time because it reminds her of our childhood and of home. She loves making our family Bolognese sauce but is always trying to find different ways to serve it. In America, spaghetti butternut squash is widely available when in season and, once cooked, almost resembles spaghetti. In the UK it’s harder to find so I have adapted her original recipe and have use “spiralised’ squash noodles. If you have a spiraliser, it takes minutes to make these yourself, or the noodles are now available to buy in some supermarkets. Failing that, roasting a squash, scooping out the centre and serving the lamb inside is also wonderful. The lamb ‘Bolognese’ is truly delicious and a great take on a good old classic. Heat 1 tablespoon of oil in a sauté pan and gently fry the onion for 10 minutes until really soft and golden. Add the garlic and fry for another minute, then add the lamb. Increase the heat and fry, breaking up the mince with a spatula, until it is browned all over. Add the wine and bubble until reduced by half, then add the tomatoes, tomato puree and stock. Season well and simmer gently for 1 1/2 hours, adding more stock if it gets a little too dry. Meanwhile, heat the oven to 190C / gas 5. Peel the squash and use a spiraliser to spiralise the long part (body) into noodles. Cut the bulb in half and scoop out the seeds. Put the 'bowls’ in a roasting tin, season and drizzle with oil, then roast for 30-40 minutes, adding the noodles alter about 20 minutes with another drizzle of oil. Roast until the noodles and bowls are tender. Stir the mint into the 'Bolognese’ sauce. Serve the roasted noodles with the sauce and scatter over the feta cheese and mint leaves. Save the roasted bowls for another time or you could serve these as well.